A combination of space and ground-based observations, including X-ray data from Chandra, has helped reveal the nature of the so-called anomalous arms in the spiral galaxy NGC 4258 (also known as M106). These arms have been known for decades, but their origin remained mysterious to astronomers. In visible (shown in gold) and infrared (red) light, two prominent arms emanate from the bright nucleus and spiral outward. These arms are dominated by young, bright stars, which light up the gas within the arms. But in radio (purple) and Chandra's X-ray (blue) images, two additional spiral arms are seen. By analyzing data from XMM-Newton, Spitzer, and Chandra, scientists have confirmed earlier suspicions that the ghostly arms represent regions of gas that are being violently heated by shock waves. 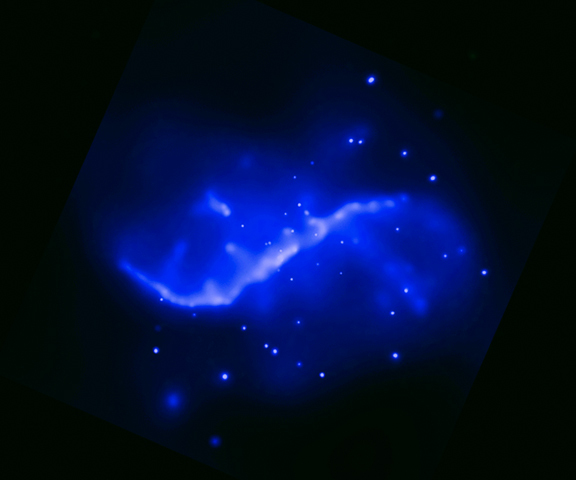 Previously, some astronomers had suggested that the anomalous arms are jets of particles being ejected by a supermassive black hole in nucleus of NGC 4258. But radio observations at the Very Large Array later identified another pair of jets originating in the core. However, the jets do heat the gas in their line of travel, forming an expanding cocoon. 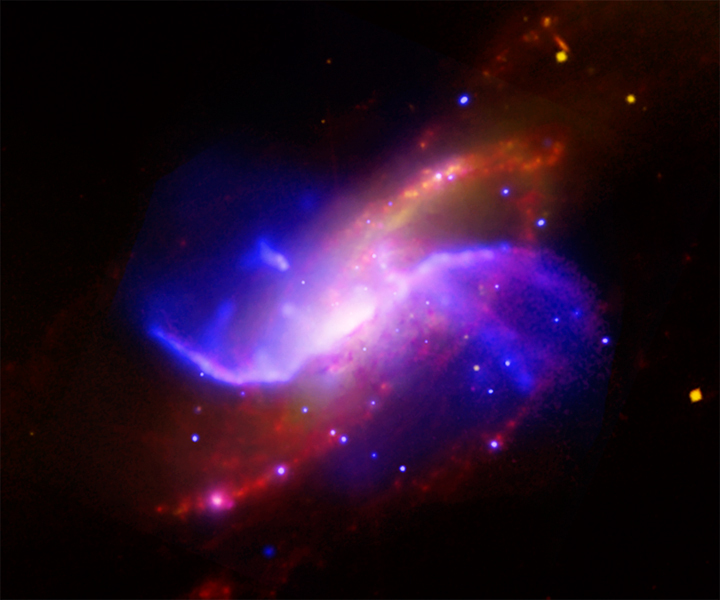 Because the jets lie close to M106's disk, the cocoon generates shock waves and heat the gas in the disk to millions of degrees, causing it to radiate brightly in X-rays and other wavelengths. Scale Image is 9.2 x 7.5 arcmin. Coordinates (J2000) RA 2h 19m 00s | Dec +47° 18´ 00"